Toys are an essential part of bird health and wellness. In the wild they are highly social animals spending upto 70% of their time foraging for products. Providing a wide variety of toys and changing them frequently helps to similate you parrot, promotes exercise, and enriches your parrots life. Everything Birds represents a wide variety of quality bird toys at discounted prices. Shop our toy section for ladders, swings, foot toys, foraging bird toys, small and large bird toys, seasonal bird toys, and much more. We also offer packages on our most popular bird toys at discounted prices. 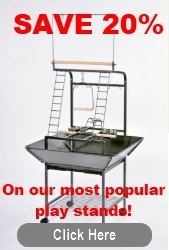 Lots of busy fun for your small parrot! Hand selected assortment of toy favorites for medium sized parrots.